Currently on view at Gasser/Grunert in Chelsea, is Collapsible Anatomy by Michael Alan. I’ve loosely followed Michael’s work since being introduced to him in 2003 by Kathleen Marquis a former fellow grad student of his at Pratt Institute. That, combined with a moniker, a blinking light per say, in context with the Manhattan urban sphere has caught and kept my attention over the years. Seeing his current paintings, on display at Gasser/Grunert, is a reminder of a dialogue created through mark making, honing back to a prehistoric time, a distant yet accessible form of communication. Michael’s work is a visual, linear, break dancing session from the early 80’s. His line quality and use of color explodes on the surface hinting at figuration and a sense of environment even if at quick glance the amalgam of chaotic action appears unrecognizable. The scratchy quality of eerie pastels and hints of fuchsia radiate in between areas that are white and navigate between positive and negative shapes. 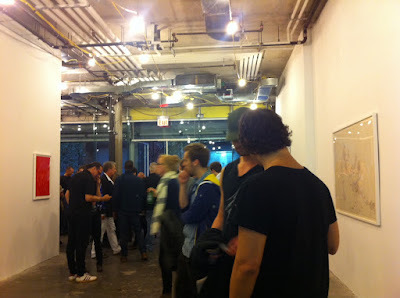 Opening night, the large gallery interior was filled with colorful people. A mix of suits and piercings. It was my final event for the night and a good one at that. Michael Alan: Collapsible Anatomy is on view until Saturday, June 18th, 2011. He will also be a participating artist in this weekends Festival of Ideas For The New City as part of Flash:Light NYC, sponsored by the New Museum. Many openings and events going on. Stay tuned for a feature on Ryan Uzilevsky / Farkas Fülöp.